Do you know how many Japanese recipes? Maybe you might answer the dish such as Sushi, Sukiyaki, Templa, and so on. These kinds of foods are also traditional Japanese food; however, there are more familiar and traditional foods among Japanese people. It is so-called home-cooked Japanese dish, “家庭料理[kateiryo-ri]”. Today, I would like to introduce the recipe of the dish “肉じゃが（Nikujaga）. This is one of the most famous foods among Japan. ‘Niku’ means meat and ‘jaga’ means potates. The interesting point of this food is that you can guess the people’s hometown by what meat they use in it. This is because, there is some difference in the ingredient: the upper region from Chubu tends to use pork, on the other hands, lower region often use beef in it. 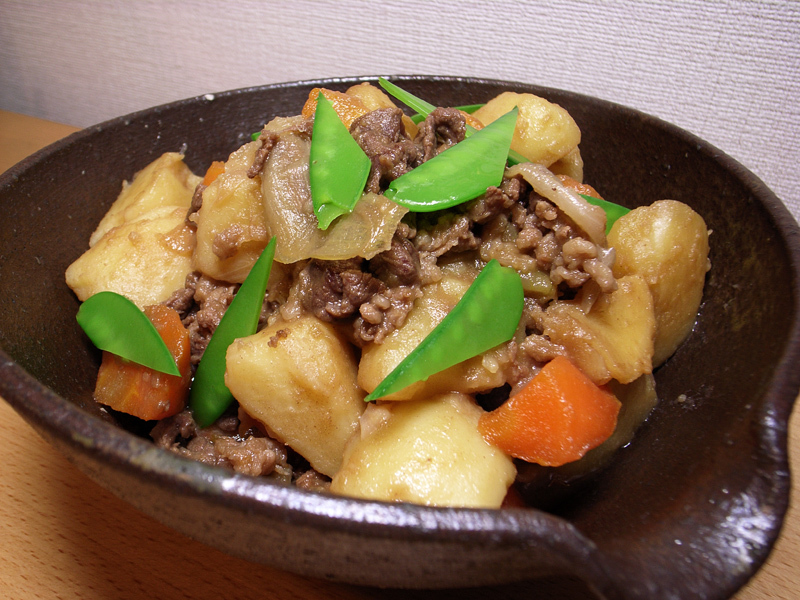 My hometown is lower region in Japan, so I will introduce the recipe which use beef. Nikujaga’s ingredients is vegetable oil, beef, thick slices onion, Yukon gold potates, large cut carrot, fresh shiitake mushrooms, sake, dashi, sugar, salt, soy sauce, shirataki noodles, and trimmed green beans. First of all, stir-fry the beef until it gets brown in the pot. Then add the vegetables except green beans and continue to cook until it is thoroughly cooked. After that, add the dashi and seasonings by dashi, sugar, salt, and soy sauce order. Then add Shirataki noodles and cover with a lid and cook on medium heat for 20 minutes. After of all, add the green beans and serve the dish. You might notice many Japanese traditional seasoning is includes this list, and it looks difficult to cook. But, there are many variations also among in Japanese people, because it is home cooked recipe. So, I would like you to enjoy this dish freely without being eager.